ARLINGTON, VA, December 18, 2014 – Just in time for the holiday season, PBS KIDS has released a new THOMAS & FRIENDS app for iPhone, iPad and iPod touch. THOMAS & FRIENDS Watch and Play is the first THOMAS & FRIENDS app to offer full-length episodes, in addition to games that promote key problem-solving skills and foster social-emotional growth for preschoolers. 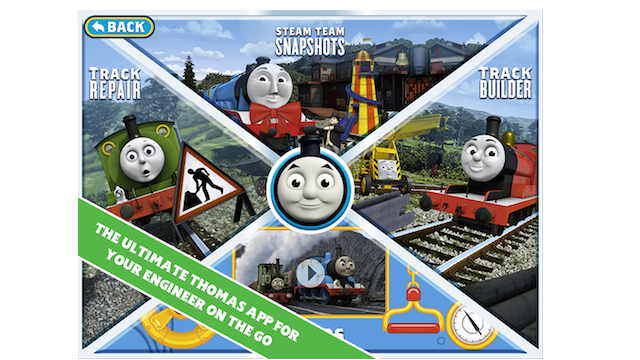 The app features three games in which kids can build, fix and create train tracks and scenes. THOMAS & FRIENDS Watch and Play also offers a train-themed video player, allowing kids to watch clips and full episodes from THOMAS & FRIENDS, and related parent information.Produced by HIT Entertainment, THOMAS & FRIENDS airs weekdays on PBS stations (check local listings). Videos: Children can watch full episodes and clips of THOMAS & FRIENDS in an engine-themed video player. Track Builder Game: Focusing on storytelling, creativity and exploration, kids can build their own interactive train track for Thomas and his friends. Track Repair Game: Kids learn to repair train tracks to help the engines make deliveries through problem solving and self-efficacy skills. Steam Team Snapshots Game: Children practice storytelling and socio-emotional skills as they create and photograph their own animated scene on the Island of Sodor. THOMAS & FRIENDS Watch and Play is part of PBS KIDS’ ongoing commitment to using the power of media to help kids succeed in school and in life. THOMAS & FRIENDS Watch and Play is available for $2.99 on the App Store for iPhone, iPad and iPod touch or at www.AppStore.com/PBSKIDS. Images of THOMAS & FRIENDS Watch and Play can be found on PBS PressRoom. HIT Entertainment is one of the world's leading preschool entertainment companies, specializing in building powerful brands based on engaging stories. HIT Entertainment’s world-class portfolio includes Thomas & Friends®, Mike the Knight™, Fireman Sam®, Bob the Builder, Barney®, Angelina Ballerina®, Pingu® and Rainbow Magic®.